The Capital One® QuicksilverOne® Cash Rewards Credit Card is a cash back credit card that charges a $39 annual fee and earns a flat, unlimited 1.5% cash back rate on every purchase. Cash back rewards can be redeemed for a variety of cash equivalents, including paper checks and statement credits. Capital One QuicksilverOne is among a relative handful of cash back credit cards without an early spend bonus. 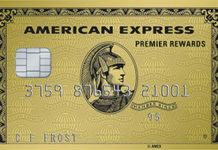 On the other hand, this card has unusually lax credit requirements – prospects with average credit are welcome to apply. If you make timely, in full payments for at least five months following approval, you’re rewarded with a higher credit limit. 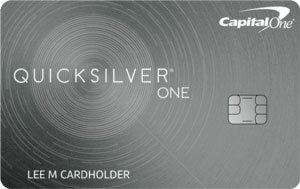 QuicksilverOne is similar to Capital One Quicksilver, which is basically a no-annual-fee version of this card. Other popular alternatives include Citi Double Cash, BankAmericard Cash Rewards, Discover it, Chase Freedom, and American Express Blue Cash Everyday. Capital One QuicksilverOne earns an unlimited 1.5% cash back on every purchase. There are no caps, restrictions, or tiered spending categories to worry about here. You can manually redeem accumulated rewards at any time and in any amount for statement credits, gift cards, or paper checks. If you prefer, you can schedule automatic redemptions that execute when you hit a specified cash back increment: $25, $50, $100, or $200. This card charges a $39 annual fee. There is no foreign transaction fee or balance transfer fee, though it’s important to note that you’re not allowed to make balance transfers from existing Capital One accounts – including merchant-branded accounts, such as Kohl’s and GM. Cash advances cost $39. Late payments cost $35 apiece. This card comes with access to Capital One CreditWise, a suite of credit-building and -education tools that includes a free credit score with your monthly statement. You can also access your score at any time through your online account dashboard. Complimentary collision and damage insurance on rental cars reserved with the card. This card requires average or fair credit. Capital One tolerates some blemishes on applicants’ credit histories. After you make your first five payments on time, Capital One may grant you access to a higher credit line. Accepts Applicants With Average Credit. One of QuicksilverOne’s biggest benefits is its relatively lax credit standards for new applicants, which makes it ideal for cardholders looking to build or rebuild credit. Even if you have some dings on your credit profile, your application has a good chance of being accepted. That’s certainly not the case for the regular Quicksilver card, nor for such competitors as Citi Double Cash. Rewards Can Be Redeemed in Any Amount. Capital One doesn’t impose any limits on how or when you can manually redeem accumulated cash back – you can do so in any amount, at any time. That’s not the case for BankAmericard Cash Rewards, which imposes a $25 minimum redemption threshold. No Balance Transfer Fee or Foreign Transaction Fee. QuicksilverOne doesn’t charge balance transfer fees or a foreign transaction fee. Together, these two breaks can significantly reduce the cost of using this card, and render QuicksilverOne more attractive to people who travel internationally or need to transfer high-interest balances from other cards. No Penalty APR. QuicksilverOne doesn’t impose penalty interest. That’s great news for cardholders who occasionally miss payments, and a big differentiator relative to BankAmericard Cash Rewards, Citi Double Cash, American Express EveryDay, and Blue Cash Everyday. No Rotating Spending Categories or Manual Activation. QuicksilverOne’s cash back system couldn’t be simpler: The card earns a flat, unlimited 1.5% cash back on all purchases. You don’t have to worry about minding tiered spending categories or quarterly rotating categories, and there’s no manual activation hoop to jump through every 3 months. Notably, Discover it and Chase Freedom require manual activation for their quarterly 5% cash back categories. Has an Annual Fee. Though QuicksilverOne’s $39 annual fee is modest in the grand scheme of things, it’s still a disadvantage relative to the many cash back cards that have no annual fees at all. These include Discover it Cash Back, Chase Freedom, Citi Double Cash, and many others. No Early Spend Bonus. Unlike many cash back cards, the QuicksilverOne Card doesn’t offer an early spend bonus. That’s a big disadvantage for new cardholders in search of an early cash boost. For a generous, attainable early spend bonus, look to Chase Freedom, which offers $150 when you spend $500 within 3 months of account opening. High Regular APR. QuicksilverOne has a very high regular APR – well above the cash back category’s average. Cards like Discover it and BankAmericard Cash Rewards have much more manageable APRs for cardholders who like to carry balances. No Intro APR Promotion. Unlike the regular Quicksilver Card, Capital One’s QuicksilverOne Card doesn’t have an introductory 0% APR promotion for purchases or balance transfers. That’s a drawback relative to many other cash back cards, including Citi Double Cash and Chase Freedom. Both give at least 15 months for purchases and balance transfers. The Capital One® QuicksilverOne® Cash Rewards Credit Card is one of the few cash back cards that openly advertises itself to applicants with average credit. Compared to Quicksilver, its stablemate, this is a big benefit. That said, you shouldn’t expect your QuicksilverOne account to come with a sky-high credit limit. If your credit isn’t great, your initial approval is likely to include a restrictive limit that invites you to prove yourself capable of using credit responsibly. If successful, you’ll be rewarded after some months with a higher credit limit – and, if all goes well, an invitation to apply for the Quicksilver Card, which has a lower regular APR and no annual fee. The Capital One® QuicksilverOne® Cash Rewards Credit Card is a tailor-made first cash back card. It’s especially attractive to consumers whose less-than-perfect credit profiles preclude them from obtaining annual-fee-free rewards cards with lower interest rates. Due to the annual fee and the high APR, it’s not ideal for people who spend lightly or intend to carry balances from month to month. The fact that this card allows for applicants with average credit straightforward rewards system, flexible redemption opportunities, and its lack of a balance transfer and foreign transaction fee, are all nice benefits. The $39 annual fee, high APR, lackluster intro APR promotion, and the lack of an early spend bonus are all drawbacks. Overall, this is a very good starter cash back card for moderate spenders.